Some rabid fans of the YA fantasy series scored opening-day passes. From left, Josh Hutcherson, Jennifer Lawrence and Liam Hemsworth arrive at the world premiere of "The Hunger Games" in Los Angeles. 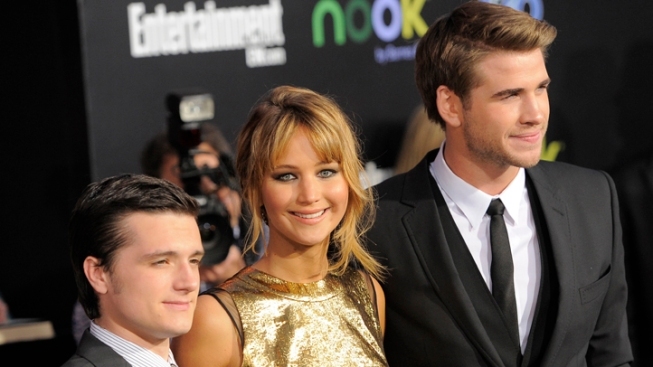 Hundreds of fans who camped out overnight in front of the Nokia Theatre in Los Angeles were rewarded with tickets to "The Hunger Games" premiere. The frenzy surrounding the big-screen adaptation of the first book in the young-adult series took over the plaza in front of the theater Monday, with fans and media lining the black carpet. Ticket websites report anticipation for "The Hunger Games" film matches and may even surpass that for the "Twilight" movies. The last film in that series is set for a fall release. "The Hunger Games" stars Jennifer Lawrence, Josh Hutcherson and Liam Hemsworth as teens fighting for survival in a government-controlled world that hosts annual televised games in which participants are forced to kill their opponents. The film is set for release March 23.